When it comes to your immediate family, birthdays are a big deal. So, when your brother’s birthday is coming up, you need to prepare for a wonderful celebration. 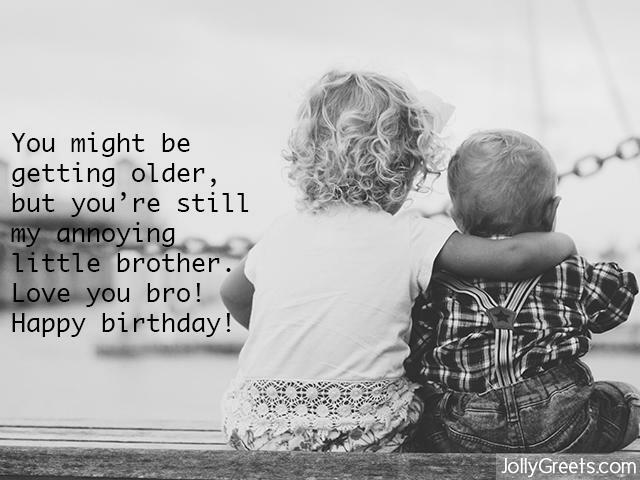 A thoughtful birthday message is a perfect way to let your brother know that you care and that you love him. This article contains an assortment of funny, heartfelt, and sincere birthday wishes for your brother. Just watch as your loving message makes his special day even more special! Who doesn’t love to make their brother laugh? His birthday is a fitting time to bring a smile to his face with one of these funny birthday wishes. We may not be kids anymore, but you’re still the brother who beat me in arm wrestles and helped me steal from the cookie jar. Here’s to you turning another year older! Happy birthday. No matter how old we get, I’ll still play pranks on you–you’re my brother, after all. But today, I’m here to celebrate you, and that’s no joke! Happy birthday! My dearest brother, who would’ve thought you would turn out this well? Happy birthday! Happy birthday, brother! I’m amazed that you became the kind, high-functioning man that you are today. Have a fantastic day! You can call me immature, but I’ll still give you a hard time even when we’re old and gray. Happy birthday, brother, here’s to you! Brother, today is your birthday, and the occasion tempts me to embarrass you with baby pictures. Have a fantastic celebration today, I love you! He may not be related to you by blood, but your brother-in-law is a loved member of your family. Make his birthday extra-special this year with a thoughtful message. I’m so glad that you’ve become a part of my life. We may only be related by law, but you truly feel like family. Happy birthday, wishing you a wonderful celebration! From the moment you married my sister, I knew that our lives would be better with you in it. Today, on your birthday, I hope you feel the love and joy that surrounds you. Happy birthday! I never knew that an in-law could feel so much like family. Wishing you the happiest of birthdays and an even better year to come! Technically, you’re my brother-in-law, but, to me, you’re just my brother. Today, let’s celebrate you and all the great things to come for you. Happy birthday! To my brother-in-law: Thank you for coming into our family, bringing such joy and warmth to our lives. I wish you the happiest of birthdays today, have a fantastic celebration! No matter how many years go by, he’ll always be your little brother. As his elder sister, tell him how much you care with a lovely birthday wish! We’ve grown up, become adults, chosen careers and fully matured. And, yet, in my eyes, you’re still just my little brother. Happy birthday, I hope you have a wonderful day filled with joy and plenty of cake. As your elder sister, I’ve always tried to protect you and keep you safe. Now, you’ve grown up to be a strong, great man. I know that you can take care of yourself, but know that I’ll always be here for you. Happy birthday, younger brother! It’s such a joy to be your older sister, to watch you grow up to be the wonderful man that you are now. Today, on your birthday, you’re yet another year older and I couldn’t be prouder of you. Happiest of birthdays, little brother! My dearest little brother, I am so happy for you and all that you’ve achieved. I still remember you as a little boy, curious, mischievous, and full of energy. That energy hasn’t waned, and I can’t wait to see what you do next! Happy birthday! Big brother, I have always looked up to you. You’ve been the best role model I could ask for, and for that, I am truly grateful. Have the happiest of birthdays today, I can’t wait to see all the exciting things that are to come for you. Everyone should have a big brother like you to look out for them. Thank you for always being there for me. Today, on your special day, we get to celebrate you and the amazing person that you’ve become. Happy birthday! Happy birthday to my wonderful eldest brother! I love you very much and am so excited to see what’s to come for you this year. Have a wonderful day, cheers! You’re not little kids anymore, but he’s still your rambunctious brother at heart. On his 70th birthday, give him a sincere message that he’ll truly appreciate. Happy 70th birthday to my favorite brother! You may be seven decades old, but when I look at you, I still see the energetic boy that I grew up with. Cheers to you! My dearest brother, I wish you the most wonderful 70th birthday. You have brought joy and laughter to my life, and I love you very much. Happy 70th birthday, brother! Our sibling bond has only strengthened over time, and I’m so thankful that you’ve been a part of my life through it all. Here’s to family! 70 years later, and you’re still my clever, goofy, loving brother. Happy, happy birthday to you, wishing you a joyful celebration! There’s no better time than a birthday to pass on a warm, meaningful message to your loved ones. 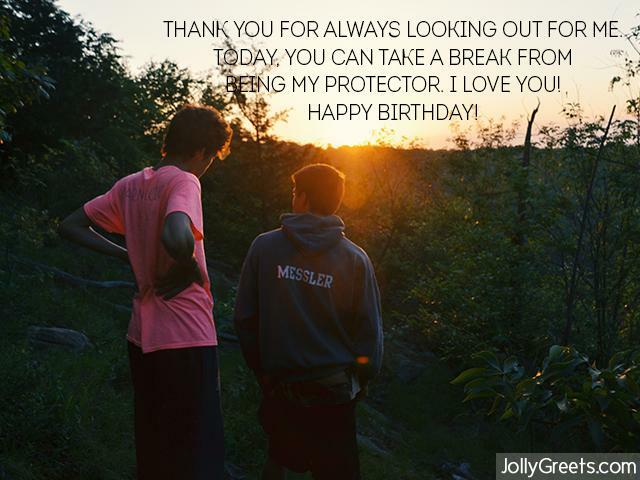 On your brother’s birthday this year, strengthen your bond and make his celebration all the more special with your selection of the birthday wishes listed above. Family comes first, after all, and your brother is no exception.